Open Bug Bounty is a platform that performs independent verification of the submitted vulnerabilities to confirm their existence as a third party. It also provides proper notifications to website owners by all available means. For example, sending notifications to a list of common email addresses, such as webmaster[at]example[dot]com or security[at]example[dot]com. 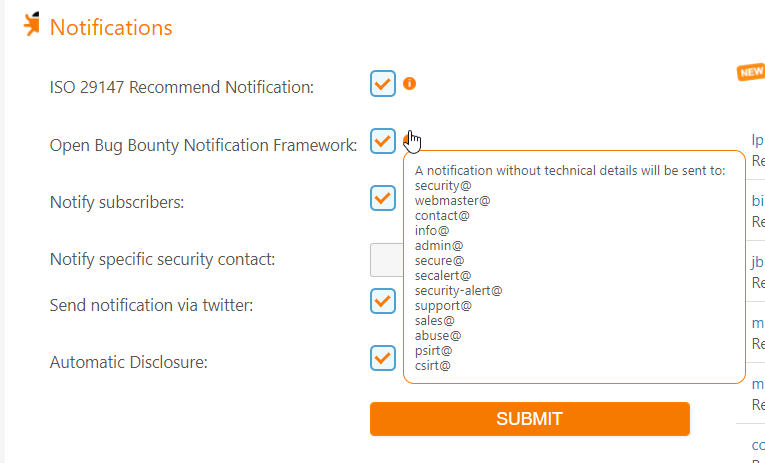 The list of email addresses which will receive a notification for a valid report. Due to the nature of this platform, security researchers are not explicitly given any permissions to perform any forms of testing on these organisations’ web assets. As such, the platform has been constantly reminding the researchers that they should only use non-intrusive testing techniques. In terms of bugs category, only non-intrusive vulnerabilities such as Cross-Site Scripting (XSS), Open Redirect and a few others are accepted on this platform. Intrusive vulnerabilities like SQL Injection are not accepted. It is extremely important to remember to not run any vulnerability scanner or automated testing on websites without permissions. Constant reminders from the administrators at Open Bug Bounty to only use non-intrusive testing techniques. 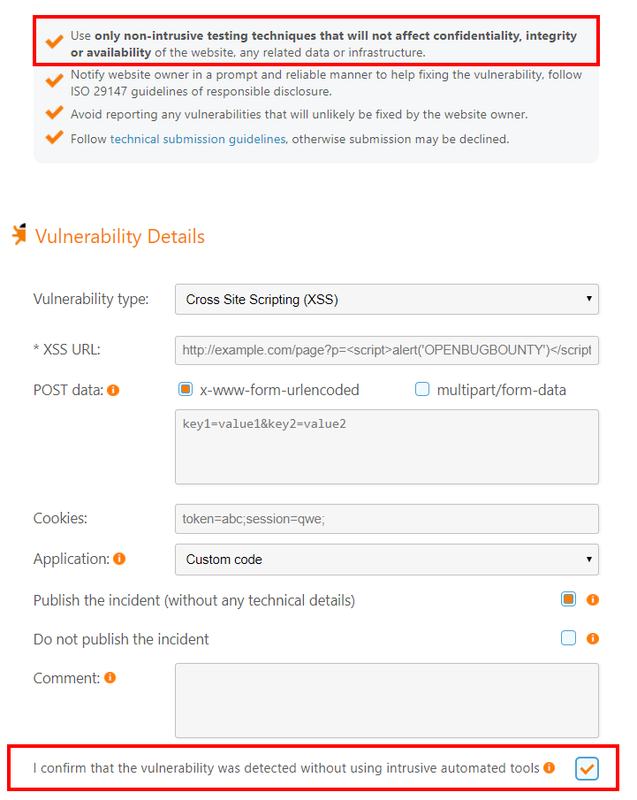 The reported bug was a simple XSS vulnerability which exploited the fact that the Login form would reflect any submitted value back onto the page and also, the fact that there is no anti-CSRF token being implemented. Fair enough, a login form by itself would usually not require any anti-CSRF token as there will not be any security risk, however, because of this, I was able to craft a CSRF proof of concept HTML page which would automatically submit a maliciously crafted HTTP POST request on behalf of the user who visits the page. The actual HTML source code after the maliciously crafted HTTP POST request has been rendered on a Firefox web browser. The following is a simple POC which I have also shared with the triage team, it is an HTML page that would automatically submit an HTTP POST request when the user visits it. No, the XSS vulnerability is not awesome. 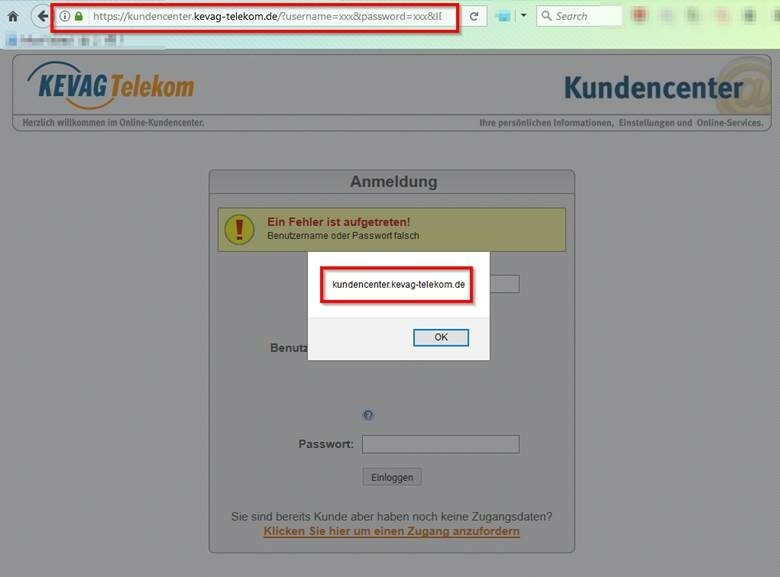 The speed and accuracy which Kevag Telekom GmbH responded to my report and triaged the vulnerability (scroll up and read step 1 to 6 again) — THAT was awesome! 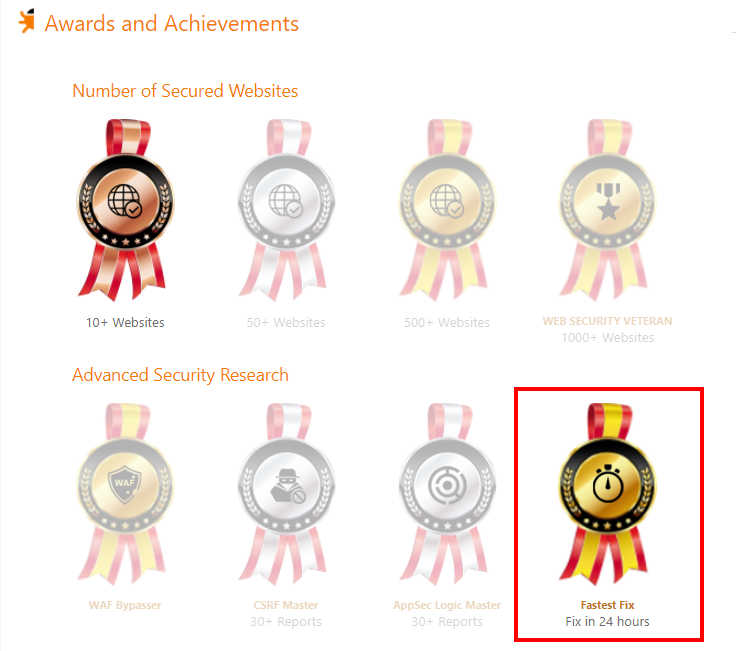 I have worked with over 50 organisations with and without Hall of Fame listings and worked with their triage team to fix security vulnerabilities before, only a handful has responded with such speed and accuracy. By accuracy, I mean those that fix the issues effectively. The more amazing thing is that the person who worked with me to fix the issues on Kevag Telekom GmbH told me that he has never heard of the Open Bug Bounty platform before our conversation. At the end of the day, he also provided feedback to me that he found that Open Bug Bounty is a great platform. He liked my report and the overall working experience was great. Can you imagine someone who does not know about this platform, get notified by it, reacted quickly and positively when I contacted him about this report, worked with me and resolved the issue effectively, then deployed it after proper internal testing? Large organisations usually have many processes and will not fix issues this quick — FYI, they are a telecommunication company, which means that they are not a small organisation either. We encourage website owners to say at least a “thank you” to the researcher or write a brief recommendation in the researcher’s profile. There is, however, absolutely no obligation or duty to express a gratitude in any manner. So, please do not blackmail the website owners, as there is no obligations to provide any bounty. Some websites might write you a recommendation, such as the following which I have received from Kevag Telekom GmbH, the 5th Dunstable Scout Group and the University of Otago. 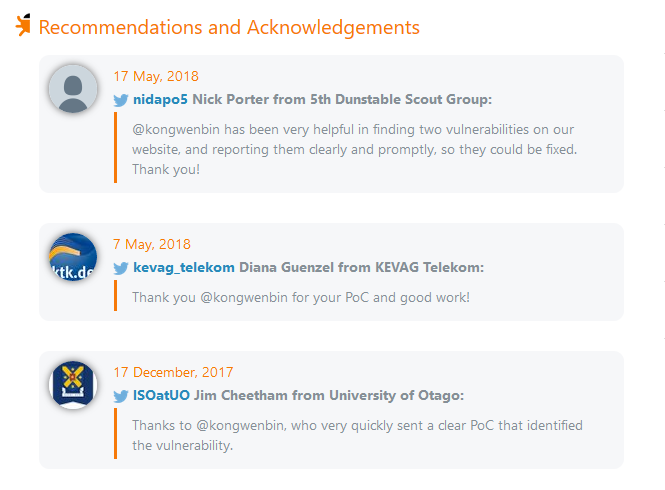 Recommendations and acknowledgements that I have received on the Open Bug Bounty platform. Disclaimer – this post is not affiliated with OpenBugBounty, Kevag Telekom GmbH or any possible parties. It is solely based on my personal experiences using the platform and interacting with any of the mentioned organisations. Most importantly, did they pay you? Thanks for your interest. No, there was no payment for this report.